This is popping up in several spots in a mulched bed around a path of stepping stones. There's a couple of fingers in the photo to show scale. 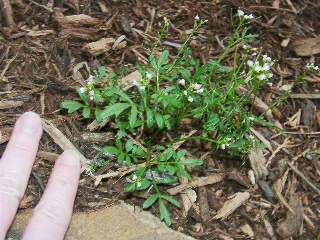 The plant is quite small with tiny white flowers. I kind of like it. I'm at 2200' in western NC. Anyone recognize it? Looks like it might be one of the 'spurge' varieties. The picture is not super easy to see details from but the leaf shape makes me a guess it is Pennsylvania bittercress (Latin name Cardamine pensylvanica). Several Cardamines bloom early in the season. Below are some pictures and a description, let me know if it fits! That's it! I had to put on my reading glasses to get a close up look at the plants and compare them to the photos in the links from J&Em. The habitat description of "low wet woods, base of moist bluffs" doesn't really describe my garden. They are not in a particularly moist area though it is shaded by house & garage walls, and we HAVE had a wet spring. They make an attractive ground cover around the stone path. I'll have to see if they survive the summer. Interesting that they can be eaten...one entire plant would hardly make a mouthful.